The Synavrio Journal, founded in 2017, began as a classroom assignment introduced by Mark Gaither, a Business Technology instructor at Lower Columbia College. The assignment was based on the Self Organized Learning Environment (S.O.L.E.) teaching and learning process developed by Sugata Mitra (Mitra and Dangwal, 2010). The first assignment involved groups of four to “brainstorm” the creation of an undergraduate peer-reviewed science journal. The second assignment involved creating the actual journal style-guide. The class as a whole, working as a community, became the founding editors for the Synavrio Journal. In the process, the decision was made to include all academic articles by college students. When the journal was introduced to members of the Business & Information Technology Club, a decision was made to put the assignment into motion. Students reported on the progress journal development and presented the concept journal to a classroom full of science students. These students were introduced to the process that would allow them, if they met the required criteria, to be published in an academic journal. Fundraising events have enabled the club to support the publishing expenses for ongoing publication of the Synavrio Journal. The Business & Information Technology Club, through activities and publications, promotes the advancement and success of students, the college, and the community. The club provides support to Lower Columbia College students through peer-to-peer activities, club-to-club support, and financial support through the B&IT Cookbook Scholarship Fund. Club sponsored internships, event planning, and service learning activities provide support to the college and the community. Finally, the club promotes the value of communication through sponsorship of student-led publications via the ongoing activities of Red Devil Press. 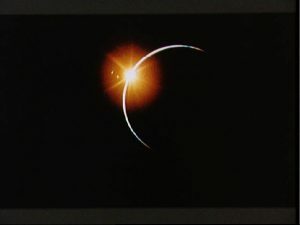 In November of 1969, homeward bound aboard the “Yankee Clipper” command module, the Apollo 12 astronauts took this dramatic photograph of the Sun emerging from behind the Earth. From this distant perspective, part of the solar disk peers over the Earth’s limb, its direct light producing the jewel like glint while sunlight scattered by the atmosphere creates the thin bright crescent.